What is Capsule? Types and Sources of Capsules? How to differentiate Between Non Vegetarian and Vegetarian Capsules? 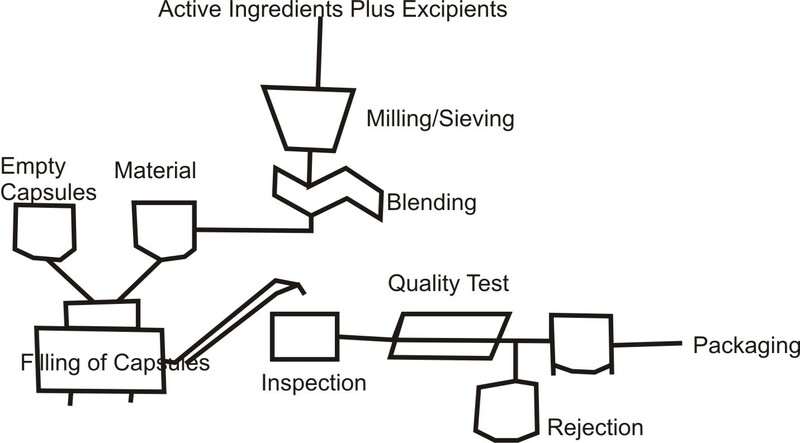 This article is part of Solid Dosage Form manufacturing. Capsule is an empty cell made of gelatin or any other material which is used to fill medicinal agents and or insert substances. Capsule cell is made-up of two source. One is Animal sources and second is vegetarian source. Animal source capsules are known as Gelatin capsule. Majority of capsules used in pharmaceutical industry is Gelatin capsules. Gelatin capsules are of two types. One is Hard gelatin capsule and Second one is Soft gelatin capsules. Hard gelatin capsules has two parts: One is body and other is Cap. Soft gelatin capsules doesn’t has body and cap portion. It is uniformed sized capsules. Vegetable Source like HPMC, Pullulan and Starch etc. Vegetarian Capsules: Ingredients used for manufacturing of vegetarian empty capsule shell are of vegetarian in nature. Most commonly used sources are HPMC. It is derived from vegetable cellulose, which is made up of the trunks of trees. Non Vegetarian Capsules (Gelatin Capsules): Ingredients used for manufacturing of animal sources. These capsules is made-up of gelatin produced by partial hydrolysis of collagen extracted from the skin, bones and connective tissues of animals. It is mixture of peptides and proteins. How to differentiate Between Non Vegetarian and Vegetarian Capsules? In pharmaceutical preparation, there is no way, that can check from packaging that it contains vegetarian or non veg capsule. There is no provision under drug and cosmetic act to indicate the source of capsules. 99% of capsules that are used in pharmaceutical sector is of animal source means Gelatin Capsules. But at Food and Dietary Supplements, you can check by seeing Brown Dot or Green Dot at packaging. Brown dot indicates non vegetarian source whereas Green Dot indicates Vegetarian Source. Hard Gelatin Capsules: Hard Gelatin Capsules shell contains two parts: Body and Cap which is inter locked to build complete shell. The shells are produced industrially by the mechanical dipping of pins or pegs of the desired shape and diameter into a temperature controlled reservoir of melted gelatin mixture dried, each capsule part is trimmed mechanically to the proper length and removed from the pegs, and the capsule bodies and caps are joined together. It is important that the thickness of the gelatin walls be strictly controlled so that the capsule’s body and cap fit snugly to prevent disengagement. The pegs on which the caps are formed are slightly larger in diameter than the pegs on which the bodies are formed, allowing the telescoping of the caps over the bodies. In capsule shell production, there is a continuous dipping, drying, removing, and joining of capsules as the peg-containing plates rotate in and out of the gelatin bath. Compare this volume (in ml) to volume of each size capsules. If the capsule is too large, simply multiply the capsule size in volume by the number of capsules to be prepared to obtain the final volume of the powder that is required. Then add additional excipients to the graduated cylinder containing the other powders to the mark indicated for the total volume of powder required. Formation of Soft Gelating Capsules: Soft gelatin capsules are prepared in continuous process that include formation of gelatin sheet, filled of ingredient and sealing. Processes of preparation of softgel capsules are Plate Process or rotary or reciprocating die process. In Plate process, a set of molds to form the capsule. A warm sheet of plain or colored gelatin is placed on the bottom plate of the mold and the medication-containing liquid is evenly poured on it. Then a second sheet of gelatin is carefully placed on top of the medication and the top plate of the mold is put into place. Pressure is then applied to the mold to form, fill, and seal the capsules simultaneously. The capsules are removed and washed with a solvent harmless to the capsules. Where as in rotary or reciprocating die process, it is produced, filled and sealed in a continuous operation. Most of softgels are prepared using rotary die process. In this method, liquid gelatin flow from overhead tank in two continuous ribbons by the rotary die machine. These ribbons come together between twin rotating die and form pocket of gelatin ribbon where ingredients are injected in to it. These filled material gelatin pockets are sealed by pressure and heat. Then severed from ribbon.